The DG Bar Cup is a riding class for young horses sponsored by DG Bar which is patterned after the young horse class in the Netherlands. Horses from ages 3 to 6 years old and registered FB, Stb, Reg. A or auxiliary, if the sire is approved WPN, were eligible to compete. Classes were offered throughout the US at all of the inspection locations. Caletino was the “DG Bar Cup Champion” at the Windbourne Farm keuring and was also awarded as “the most correctly ridden and trained” at this event. 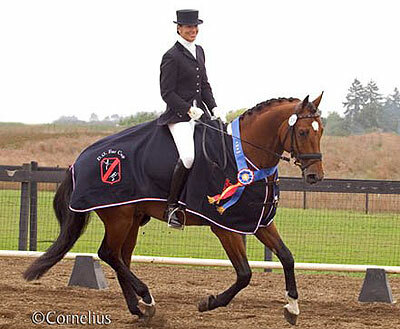 Caletino is also the “Reserve Champion” in the 2004 Cup standings for the U.S. with a score of 80.5% placing just behind “Sir Sinclair” of Iron Spring Farm.